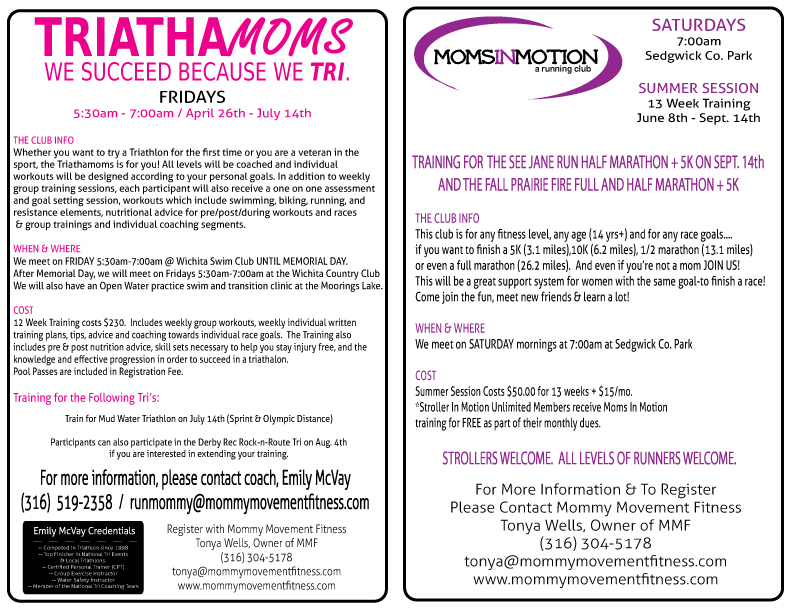 Mommy Movement Fitness: YWCA Women's Shelter, Summer Schedule, and Triathamoms! YWCA Women's Shelter, Summer Schedule, and Triathamoms! Next week is going to be our designated week to bring in our April donations for the YWCA Women's Shelter! Thank you for all of your March cereal donations!!! You guys ROCK! The week of April 22nd-27th please bring in some cleaning supplies for the shelter! They love Lysol wipes (they are easy to use but an expensive item for them to purchase). - I now have some tax deduction sheets that I will give to you when you donate!!!!! -What you will do is fill out the sheet (most important is your signature and total amount) then hand Julia or myself the white sheet (to give back to the YWCA) and you keep the yellow sheet for your taxes! -Angela, the director of the shelter would love to have your address so she can send you a Thank you card but an email will work as well! I had the privilege of being able to go on a tour of the shelter today! It was very surreal and I am counting my blessings! Angela and I talked a lot about the month of April and how it is Domestic Violence Awareness month. Their staff is saying a pledge everyday and she wanted me to pass it a long to you as well! She has asked if we would take a picture with all of our donated items and the moms and kids and send her the picture so she can put it up in the shelter for all their staff to see! Next week after each class (Monday night Fit&Tone/CoreFusion, Thursday Bootcamp, Thursday Fit&Tone/CoreFusion and Thursday Strollers In Motion) we will take a picture with all the donated items! -If you are in SIM you can bring in your donations anytime and I will have them there for the picture on Thursday or you can wait to bring them on Thursday! -If you are in another class format besides SIM make sure to bring them to class this coming week, April 22nd!!!! Thank you Angela for all the work you put into the YWCA! Tri Academy: Triathamoms is starting NEXT WEEK!!!!! See flyer below for more details and contact Emily ASAP if you are interested!!! 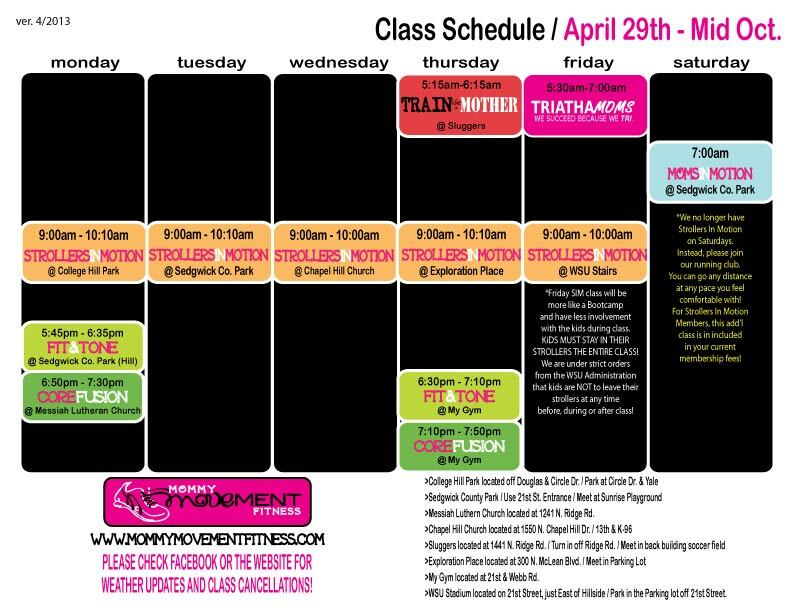 Strollers In Motion we will start our summer schedule a week from this Monday!!!! We will start Monday, April 29th! Schedule below! If it is still too cold or raining then we will meet at Sluggers (even if it is a Monday or Wed.) through the month of May! After May we will not have a place to go when it rains! Mommy Movement Fitness. Awesome Inc. theme. Theme images by enjoynz. Powered by Blogger.